Corn Silage Processing Score (CSPS). As we head into fall and corn begins to be harvested for silage, it is time to consider factors that influence the quality of corn silage and how to maximize the quality. 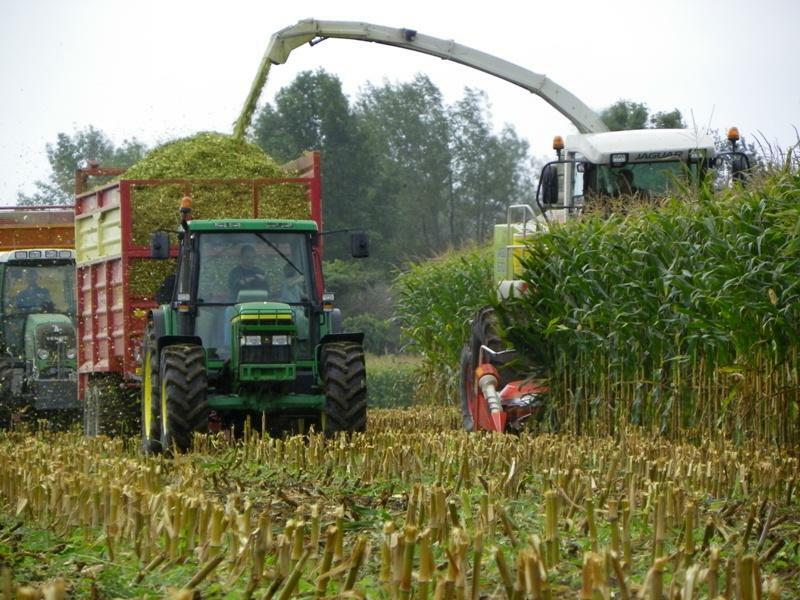 One measure of the quality of corn silage harvested is C orn S ilage P rocessing S core (CSPS). It is a qualitative determination of how well the corn kernels in the silage have been processed or pulverized. The CSPS (developed by Dr. Dave Mertens) refers to the percentage of starch that passes through the 4.75 mm sieve on a Ro-Tap Machine. Less than 50% is underprocessed, 51 to 70% is marginally processed, and >70% is optimally processed. Industry Trends. The CSPS has been used commercially for approximately the last 10 years. As farmers have become educated about CSPS, more are monitoring the CSPS of their silage. 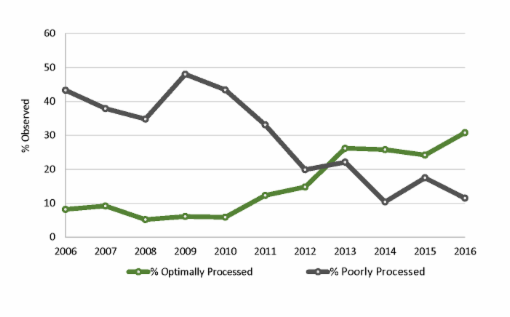 The graph below demonstrates that over time the amount of inadequately processed corn silage has declined, whereas, the amount of optimally processed corn silage has increased (CVAS, 2017). 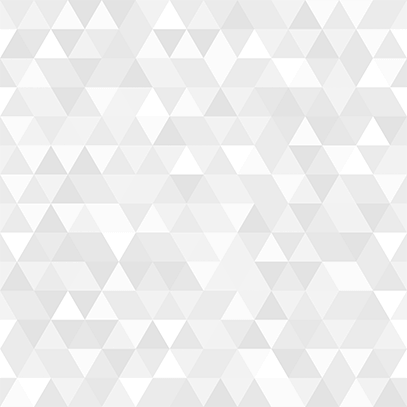 When should you evaluate CSPS? Corn Silage Processing Score (CSPS) is a valuable tool for evaluating the corn forage as it is being ensiled . It is helpful to take samples of forage as it is being harvested in the field and periodically evaluate for CSPS. This will give all parties involved an idea if the fresh chopped corn is inadequately processed, marginally processed, or optimally processed. Adjustments can be made to the harvesting equipment during harvest to make sure that the CSPS is at an optimal level. After the corn silage is chopped and ensiled, it is very difficult and cost prohibitive to process the silage as it comes out of storage. Therefore, evaluating CSPS during harvest will help optimize the quality of the forage being ensiled. Maturity of Fresh Chop Corn and CSPS. The maturity of corn silage at harvest will influence the effectiveness of CSPS. In immature corn, the starch in the corn kernels tends to pulverize causing it to attach to the forage portion of the plant (Ralph Ward, CVAS). This causes the CSPS to be lower than it actually is because the finer starch particles do not separate from the forage and travel to the appropriate sieve to be measured. Please keep this in mind if you are harvesting immature corn silage. When preparing the harvesting equipment keep in mind that lower DM silages (<32% DM) will not require as much processing for good utilization, while higher DM silages (>36% DM) will require greater processing and higher CSPS values to be well utilized. Does CSPS influence starch digestibility? The objective behind processing the corn silage prior to ensiling is to fracture the corn kernels in the corn silage. This will expose the contents inside the corn kernel (which includes starch) to the rumen microbes. This concept is demonstrated in the above slide. 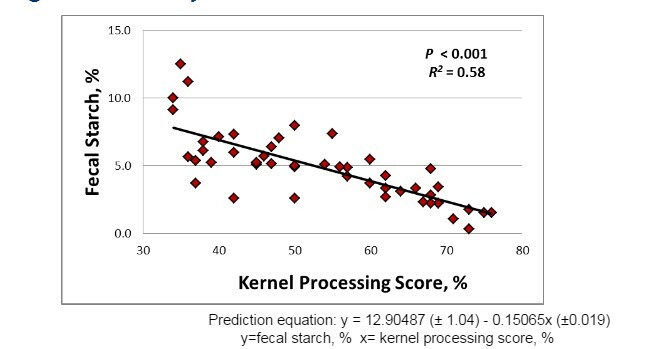 As the kernel processing score increases, the amount of starch in the feces decreases. This indicates that more starch was able to be digested and didn’t end up in the feces undigested. Harvest time is the best time to be evaluating the CSPS on your fresh chopped corn! Ag Health Labs has a Ro-Tap machine and performs CSPS in house. Drop samples off at Ag Health Labs and results will be available in 1 to 2 business days. Call, email, visit our website, or drop by if you would like more information on CSPS. Ag Health Laboratories reports some macro mineral values on the NIR results. These values are reported even though it is known that the error associated with NIR prediction of macro minerals will be higher than for organic nutrients such as protein or NDF. The reason for the higher error is that minerals are inorganic, and inorganic molecules do not absorb light energy in the near infrared region. Therefore, in order to predict the mineral value in an organic feedstuff, mineral calibrations are based off of organic molecules that have an association with minerals. It is an indirect relationship which reduces the accuracy in prediction of minerals. With that said, Ag Health Labs will continue to report NIR mineral values. However, we encourage you to use caution when interpreting reported NIR mineral values. If critical decisions (balancing DCAD rations, buying/selling hay based on mineral levels, etc.) are being made based on the mineral content of the forage, it is recommended that wet chemistry methods be used to measure mineral content. 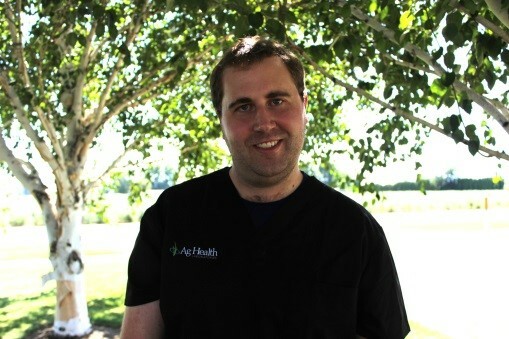 Welcome to Ag Health Laboratories! Please help us in welcoming the newest members to the Ag Health Labs team. Irma Bohlke joined the team in late 2016 and is doing the bookkeeping. 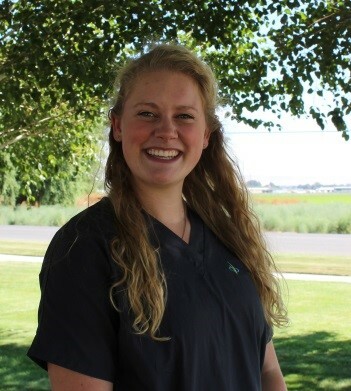 Teresa Erwin joined the team in late May and is primarily helping out in the feed lab through the fall. 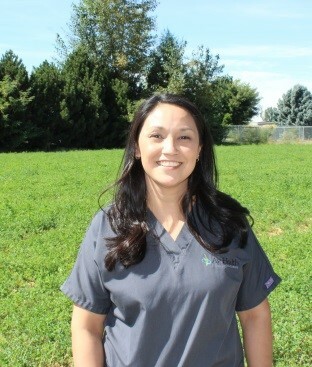 You will also see her helping out Dr. Fred Muller as a vet assistant in the future. Trent Millin joined the team in late April and is our lead milk microbiologist, as well as, running ELISA’s for BioPryn and Johnes Disease. 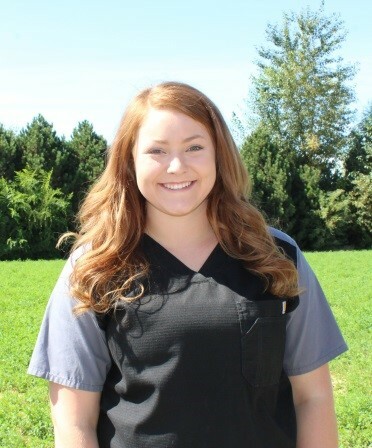 Kalie Bestebreur is helping out with feed sample processing and a variety of other daily tasks.